This Christmas cake is decorated with red & yellow Roses, yellow Blossoms & Leaves. 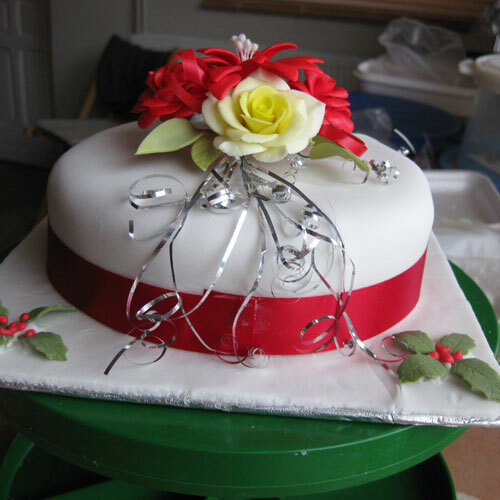 The base of the cake is finished with a red, satin ribbon. The petal shaped, fondant covered board features white Hellebores, Rose Leaves & a red ribbon to match the cake. 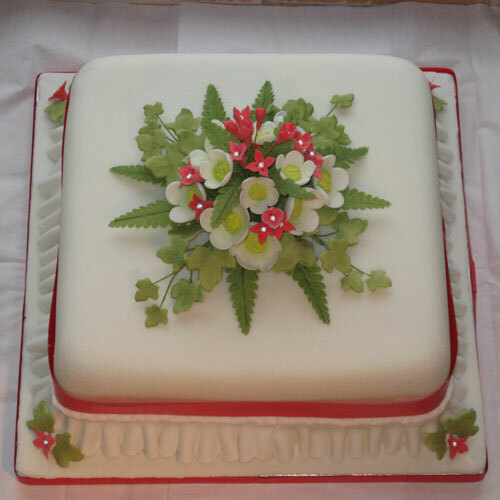 This fondant covered cake is decorated with red & white Blossoms, Fern & Ivy Leaves. The sides have a red satin ribbon & a single Garrett Frill. The cake board is decorated with Blossoms & Ivy Leaves & finished with a red ribbon. 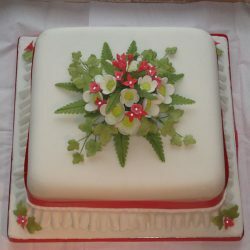 This cake is decorated with red Poinsettias, white & yellow Blossoms, Fern & Ivy Leaves. 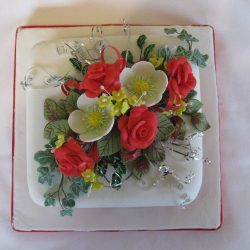 It also features 4 small, pastillage bells, filled with miniature Blossoms and ribbon picks. The fondant covered cake board is finished with a red ribbon. 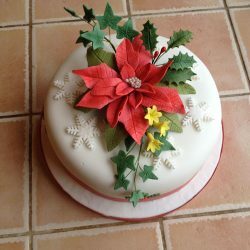 This Christmas cake is decorated with a single large Poinsettia, yellow Blossoms, Holly Leaves, Ivy Leaves & snowflakes. 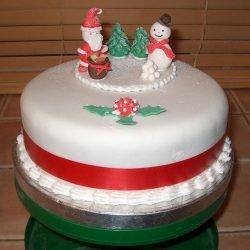 The cake is finished off with a red ribbon & the fondant covered board is also finished with a red ribbon to match the cake. This fondant covered Christmas cake is decorated with white Hellebores, yellow Blossoms, Ivy Leaves & silver picks. The cake is finished off with a yellow ribbon. 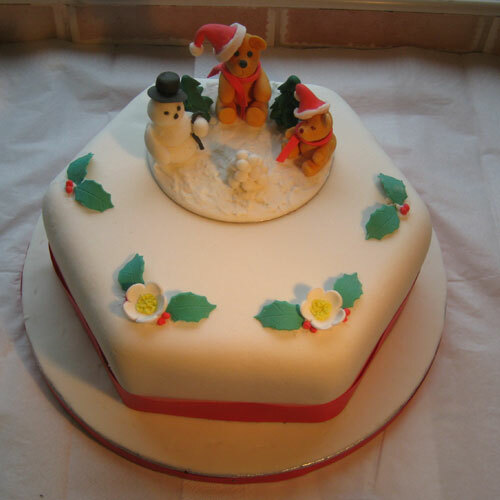 The fondant covered board is also finished with a yellow ribbon. This fondant covered Christmas cake is decorated with white Hellebores, red Roses, yellow Blossoms, Rose Leaves & red & silver picks. 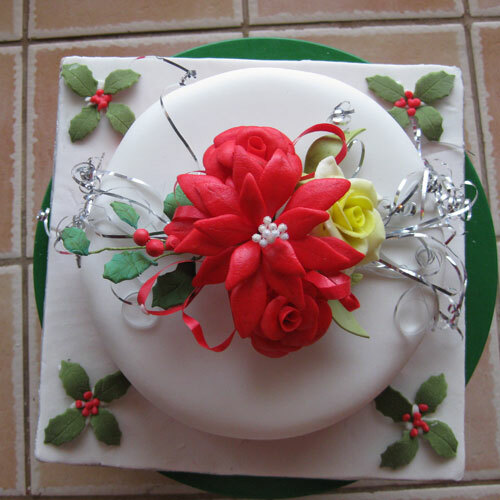 The base of the cake is finished with a red ribbon & the cake board is decorated with red Roses. 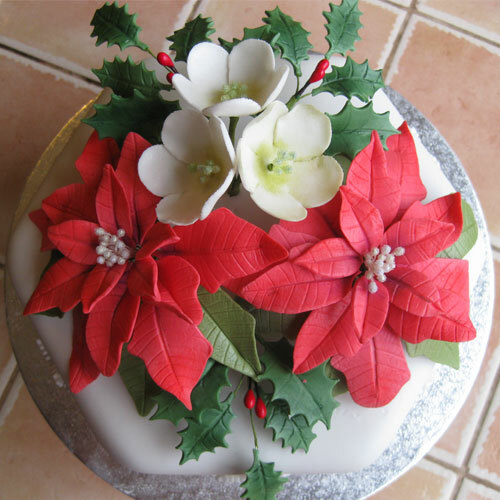 This fondant covered Christmas cake is decorated with a large, red Poinsettia, Ivy Leaves and a stem of white, open Blossoms & Buds. 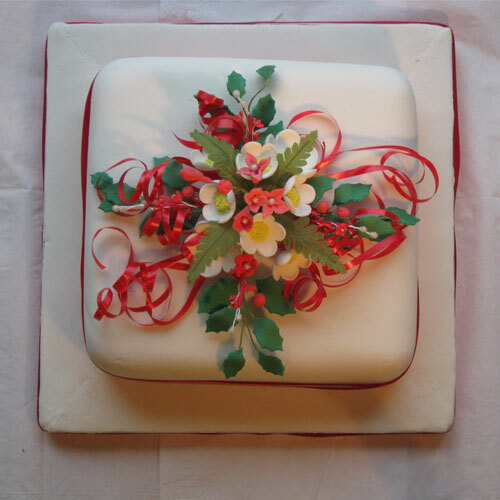 The cake is finished off with a red satin ribbon and is mounted on a fondant covered board. This cake is decorated with white Hellebores, Holly Leaves & red ribbon picks. It also features a red Candle made from pastillage. The decorations are mounted on a pastillage plaque which is removed before cutting the cake. 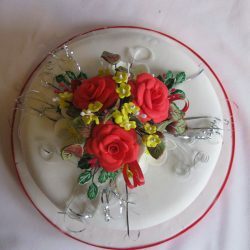 This fondant covered Christmas cake is decorated with red & yellow Roses, Leaves & silver ribbon picks. The cake is finished with a wide, red satin ribbon. The corners of the fondant covered cake board are decorated with Holly Leaves. This Christmas Cake is decorated with three Snowmen sitting around a pile of Snowballs. There are three Christmas Trees behind them and a spray of miniature Holly Leaves in front of them. The cake and the board are finished with red satin ribbon. 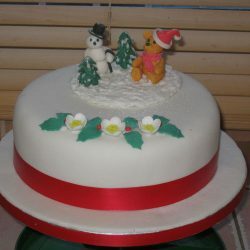 This cake is decorated with a Snowman, a Bear & two Christmas Trees made from modelling paste together with some small Hellebores & Holly Leaves around the front of the cake. 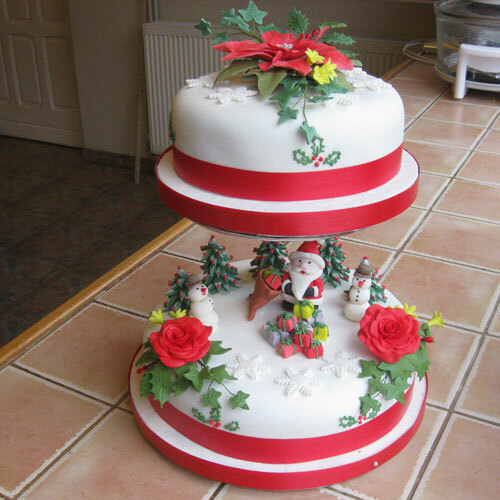 The cake & the cake board are finished with red satin ribb0n. 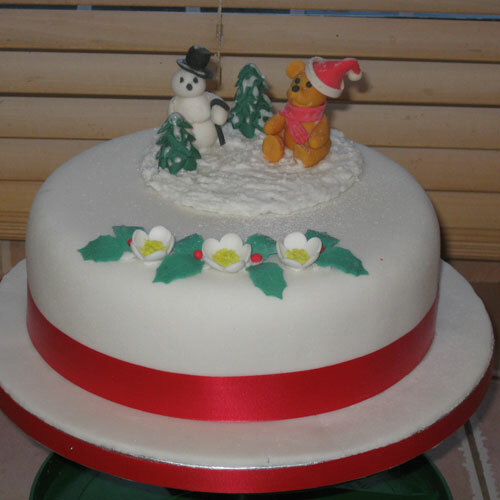 This hexagonal cake is decorated with two Teddy Bears, a Snowman & two Christmas Trees around a pile of Snowballs. There are also two miniature Hellebores & some Holly Leaves. The cake & the board are finished with a red satin ribbon. This cake is decorated with red Roses, yellow Blossoms, & Ivy Leaves. 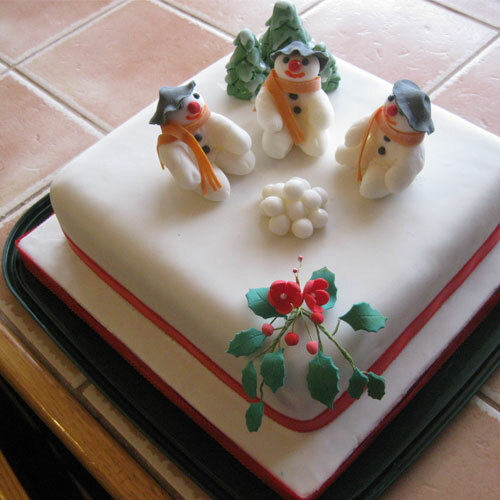 It also features a Santa, two snowmen, five Christmas trees & a sack of Christmas presents all made out of modelling paste and three fondant snowflakes. This cake is decorated with red Poinsettias, yellow Roses, yellow Blossoms & Ivy, plus a Santa, a Snowman & Penguins. On the cake board, there are Hellebores, Holly, Christmas Trees & Penguins. The figures are made from modelling paste. This cake is decorated with a Santa with presents in a sack, a Snowman with Snowballs, two Christmas Trees, Blossoms & Leaves, The cake is finished with a red satin ribbon and a Royal Icing piped border. 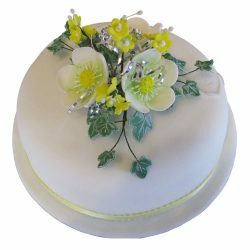 The flower arrangement for the top of this cake consists of red Roses, white Hellebores, yellow Blossoms, Ivy and Rose Leaves & silver ribbon picks. 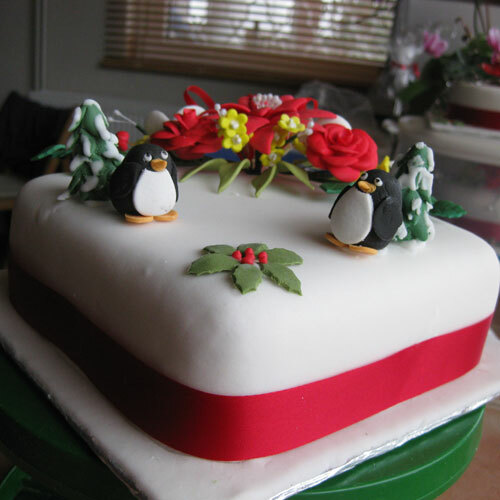 The cake is mounted on a fondant covered board and finished with red ribbon. This Christmas cake is decorated with a large red Poinsettia, white Hellebores, & Holly & the base of the cake is finished with red satin ribbon. 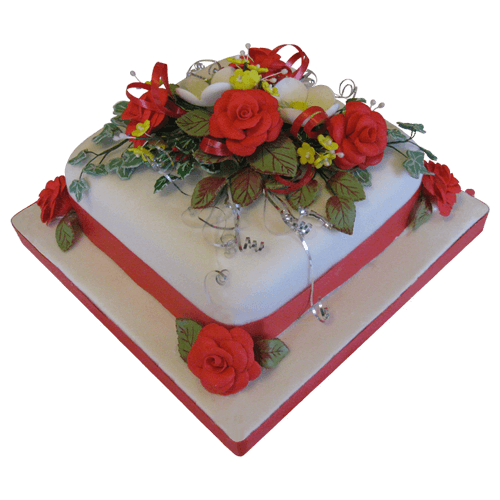 The fondant covered cake board is decorated with yellow Roses and Rose Leaves. 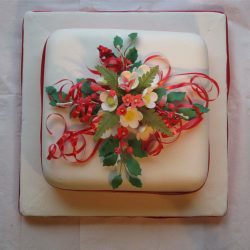 This fondant covered Christmas cake is decorated with red & white Blossoms, Fern Leaves, Holly & finished with a red satin ribbon around the sides. 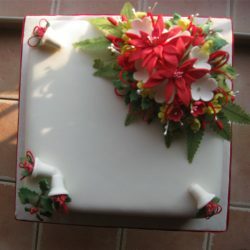 The fondant covered cake board is also finished with a red ribbon to match the cake. 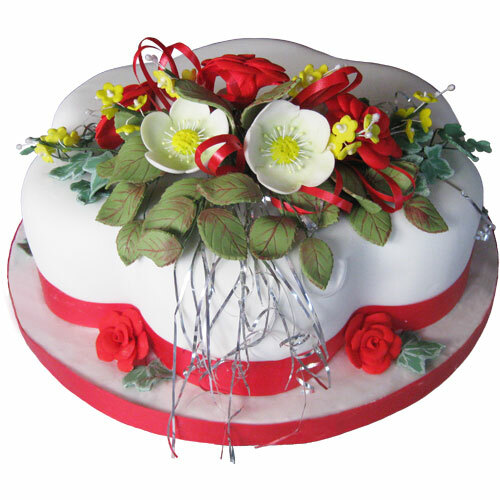 This fondant covered cake is decorated with red Roses, yellow & white Blossoms & Rose Leaves. 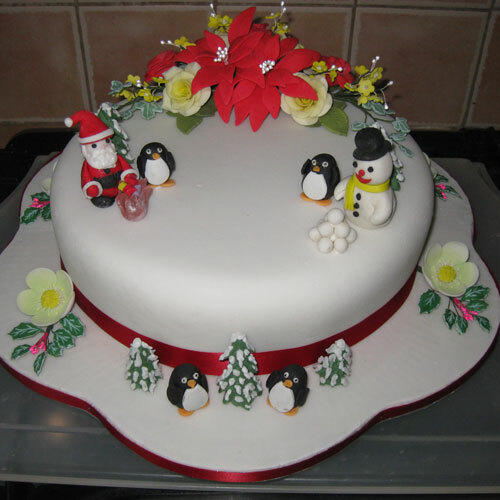 There are also two Penguins, two Christmas Trees and some Holly Leaves & Berries on the cake. It is finished with a wide red satin ribbon. This cake is decorated with a red Poinsettia, yellow Roses, a Hellebore and Rose Leaves. It also features five Penguins & six Christmas Trees & finished with a red satin ribbon. 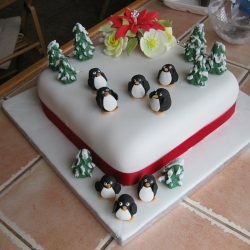 There are three Penguins & two Christmas Trees on the cake board. 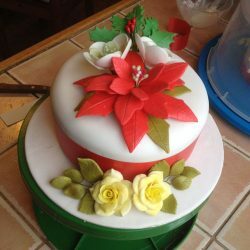 This fondant covered Christmas Cake is decorated with a red Poinsettia, red Roses, a yellow Rose, Holly Leaves & silver ribbon picks. The fondant covered cake board is decorated with Holly Leaves & Berries in the four corners. 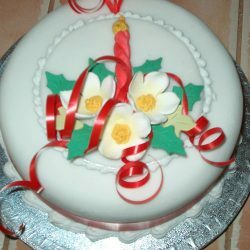 This fondant covered Christmas Cake is decorated with red Roses, yellow Blossoms, Holly & Rose Leaves & silver ribbon picks. The cake is finished with a red satin ribbon & the fondant covered board has a matching red ribbon. 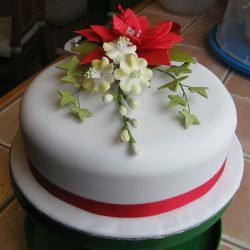 This 2 tier stacked cake is decorated with a Poinsettia, Blossoms, Ivy & Holly Leaves. 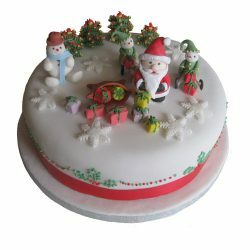 It also features Santa & a sack of presents & a Snowman with Snowballs. 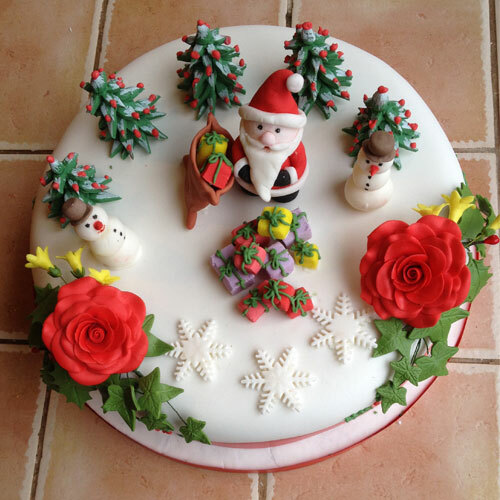 The base is finished with a ribbon, fondant Christmas Trees & Snowflakes. 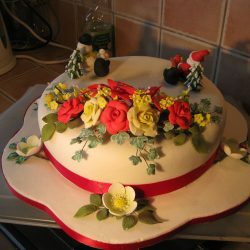 This Christmas Cake is decorated with red Roses, white Hellebores, yellow Blossoms, Rose Leaves, Ivy Leaves & silver ribbon picks. There is a wide, red, satin ribbon around the base of the cake & a red Rose in each corner. This is a 2 tier cake on a stand. The top tier is decorated with Hellebores, yellow Blossoms, Holly, Ivy & the bottom tier with a modelling paste Snowman, Santa with presents & 2 Elves. 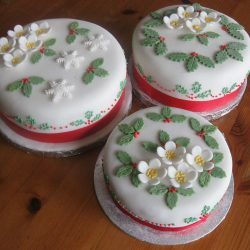 The cakes are finished with freehand piping & red satin ribbon. 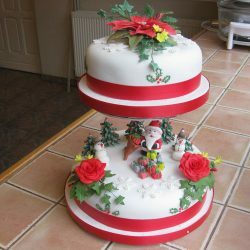 This is a 2 tier, stacked, fondant covered, hexagonal, Christmas Cake. 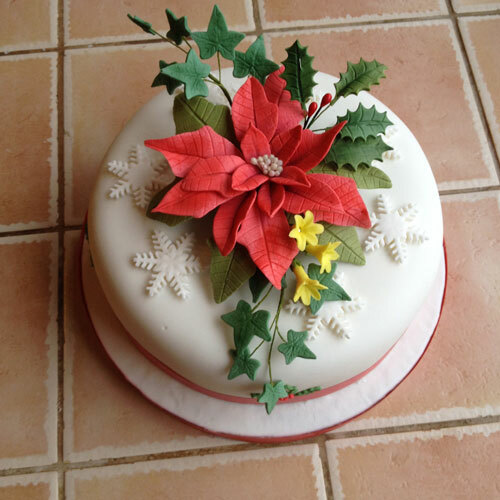 It is decorated with 2 large Poinsettias, Hellebores, Ivy & Holly Leaves & Berries. 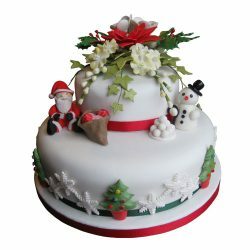 The sides of the cake are decorated with fondant snowflakes & red satin ribbon. This is a 2 tier cake on a stand. 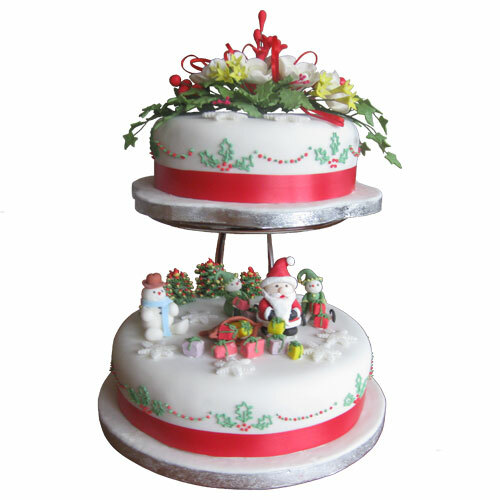 The top tier is decorated with a Poinsettia, Blossoms & Ivy Leaves, the bottom tier with Roses, Ivy & modelling paste Christmas Trees, Santa, presents, & Snowmen. Red satin ribbon finishes the cakes & the boards.